Today we said ‘Farewell’ to Dot and JB. It’s always sad to leave but fingers crossed we shall see each other again very soon. 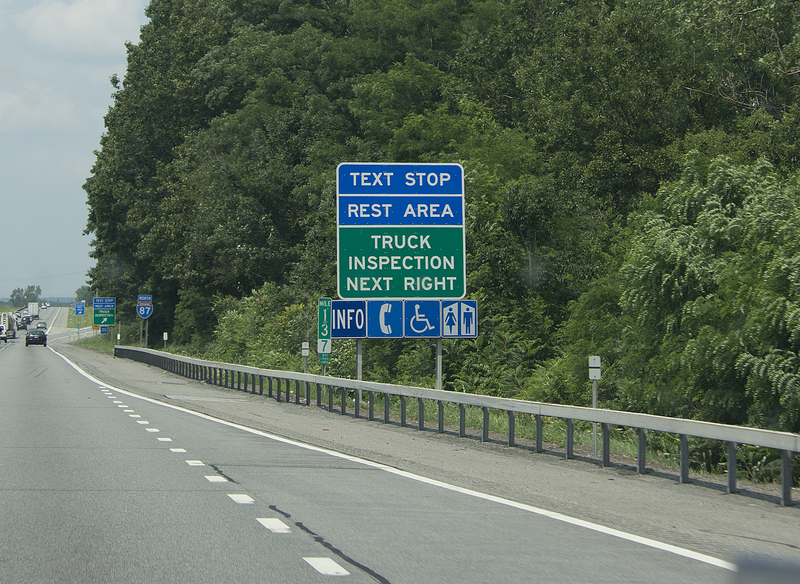 Our journey to Lake George was uneventful but we thought this was rather interesting …………….. a sign for a ‘Text Stop’, soon to arrive in the UK I’m sure! 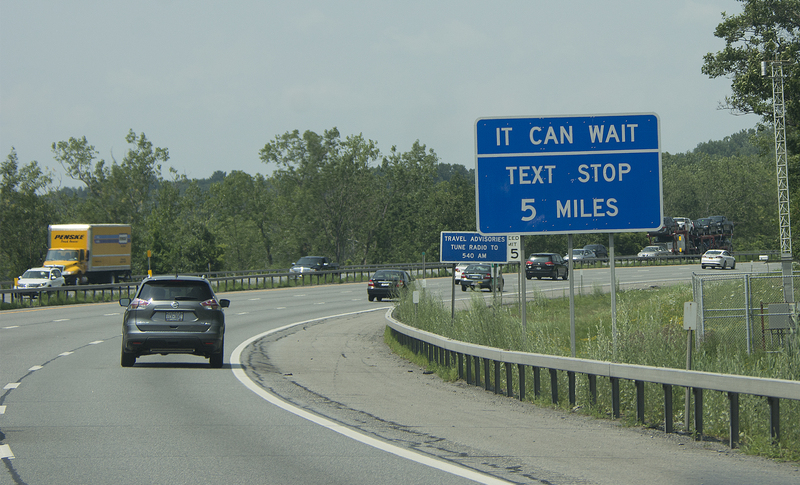 It indicates that a ‘Rest Area’ is imminent so anyone who wants to read or send a text should wait until they reach the rest area rather than texting/reading whilst driving! 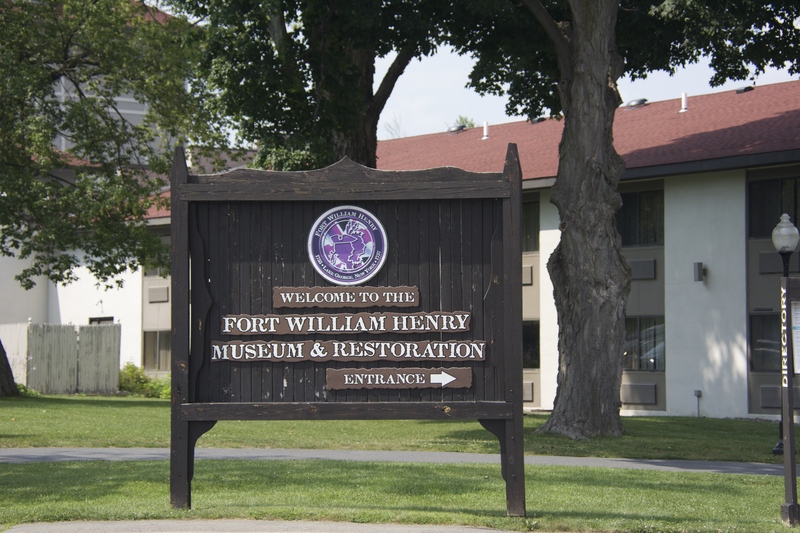 Once we had checked into our hotel we made our way to Fort William Henry. 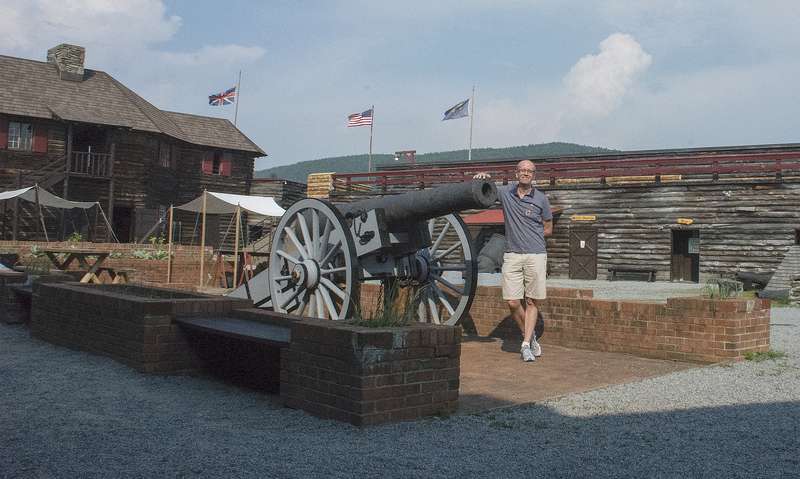 Those of you who know me well will understand why I wanted to visit the Fort ……………. it was portrayed in the movie ‘The Last of the Mohicans’ and you know I love a movie location! 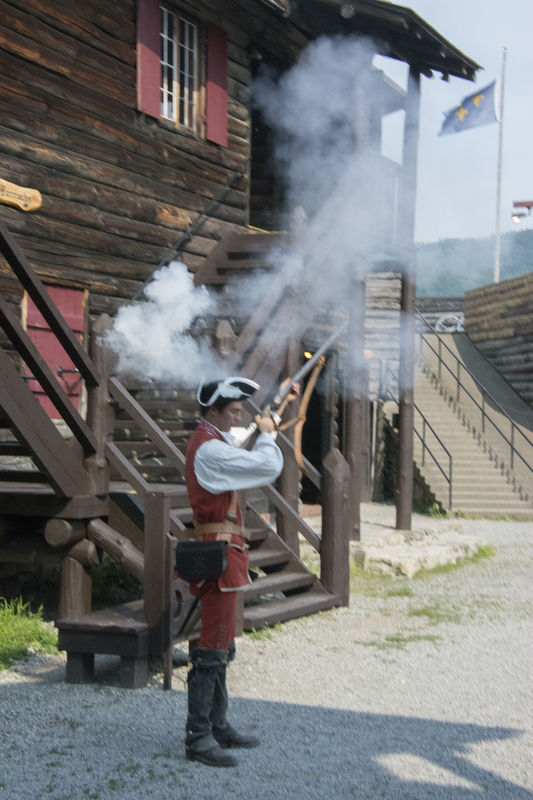 Fort William Henry was a British fort at the southern end of Lake George in the province of New York. It is best known as the site of notorious atrocities committed by the Huron tribes against the surrendered British and provincial troops following a successful French siege in 1757, an event portrayed in James Fenimore Cooper’s novel, The Last of the Mohicans, first published in January 1826. The fort’s construction was ordered by Sir William Johnson in September 1755, during the French and Indian War, as a staging ground for attacks against the French fort at Crown Point called Fort St. Frederic. 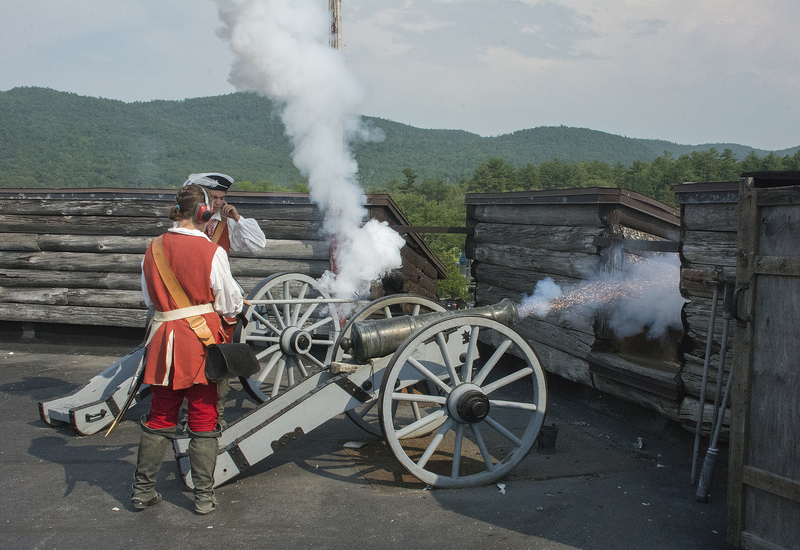 It was part of a chain of British and French forts along the important inland waterway from New York City to Montreal, and occupied a key forward location on the frontier between New York and New France. It was named for both Prince William, the Duke of Cumberland, the younger son of King George II, and Prince William Henry, Duke of Gloucester, a grandson of King George II and a younger brother of the future King George III. Following the 1757 siege, the French destroyed the fort and withdrew. 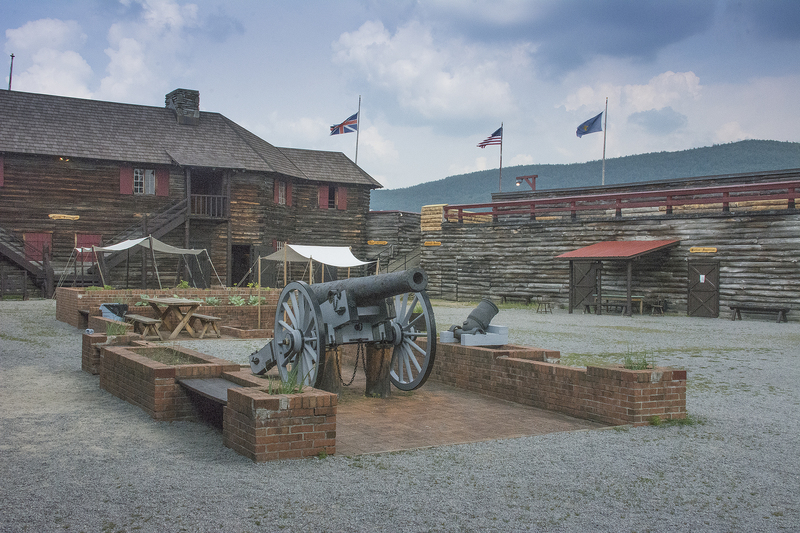 While other forts were built nearby in later years, the site of Fort William Henry lay abandoned. 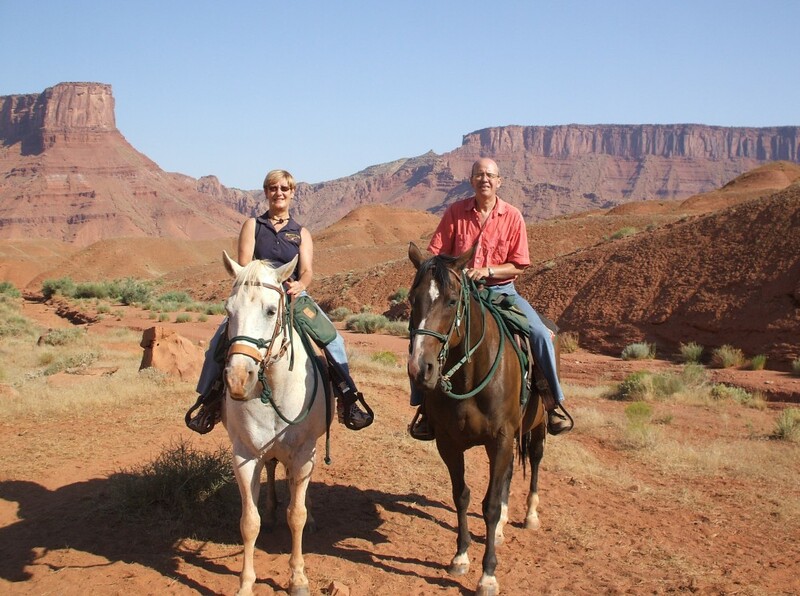 In the 19th century, it was a destination for tourists. In the 1950s interest in the history of the site revived, and a replica of the fort was constructed. 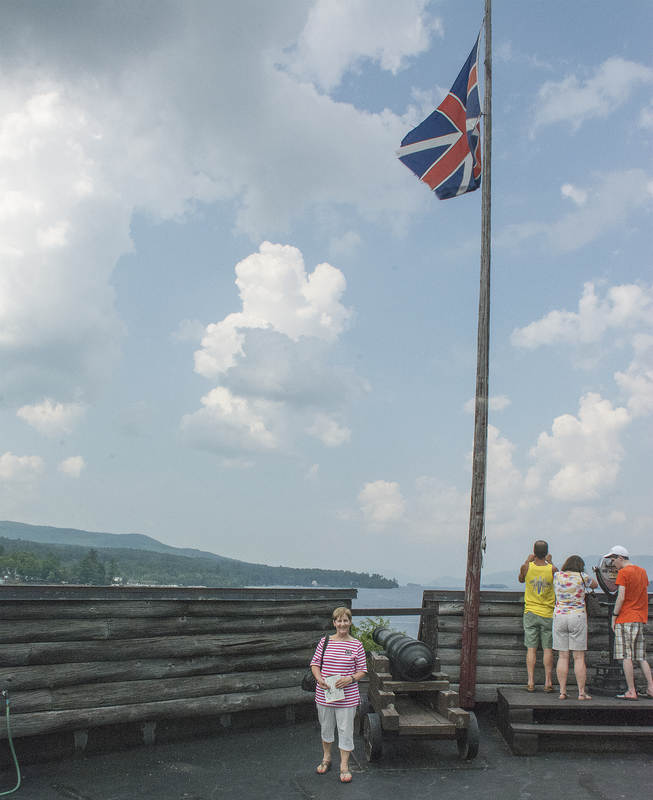 It is now operated as a living museum and a popular tourist attraction in the village of Lake George. While we were there it suddenly started to thunder and a storm rolled in but it didn’t last very long ……………. here and gone in a few minutes! For dinner tonight we took the advice of Bud on reception here at the hotel and went to eat at the Log Jam. 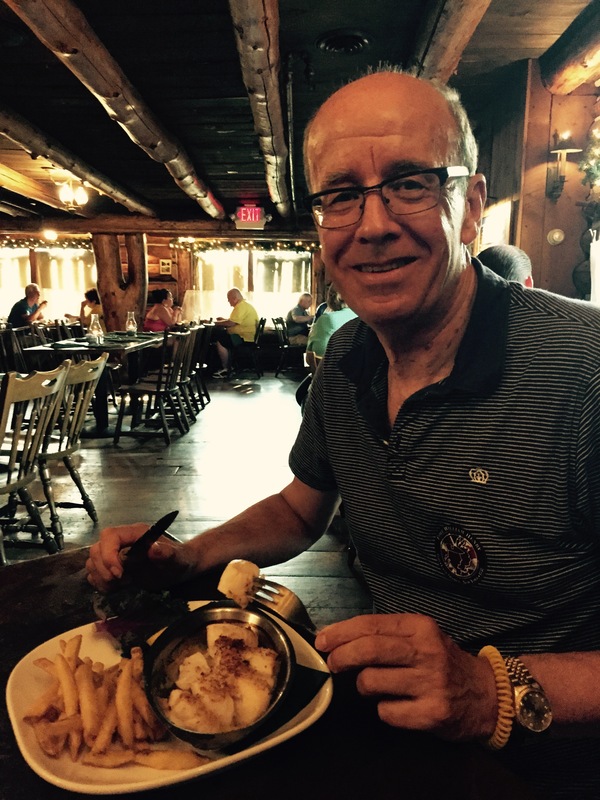 Great recommendation, great food! As this will be the last main holiday meal and as I know there are those who read the blog who do enjoy a food photo or two, I thought you may enjoy these. 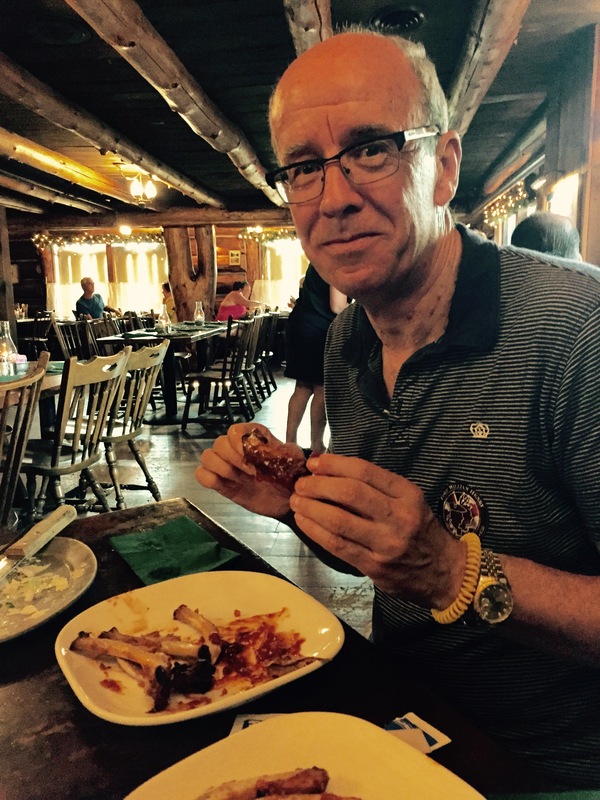 Here’s Si with his ribs and scallops and me with my salmon! Tomorrow evening we fly home and land on Wednesday morning, so our final post will be from good ol’ Blighty! Aww! 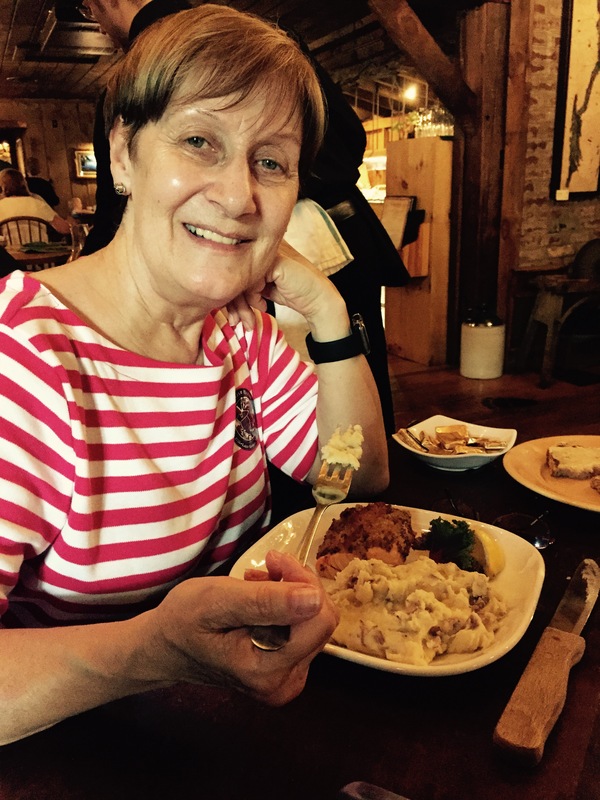 Your farewell to Dot was so bitter sweet! Have a safe journey home! I hope its uneventful after your busy holiday!! Lake George is very pretty! The storm over the lake was very neat to see in a picture! ha!! Yes, always sad to say ‘goodbye’. Thanks, it was uneventful although I did lose the cover to my watch on the plane but then found I’d been sitting on it all flight!! Lake George was lovely, would like to go there for longer. Food, food, food! Excess baggage? Have a safe flight I can’t believe how quickly this has gone. Unbelievable! Thanks Malcolm. I agree, it’s flown by. The suitcases were okay, believe it or not, no excess baggage! !